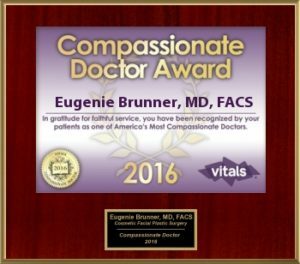 Already considered one of the top facial plastic surgeons in the Central New Jersey area, Dr. Eugenie Brunner is humbled and honored to be named one of the “Most Compassionate Doctors” by Vitals®. This renowned healthcare resource offers patients an easy and reliable way to identify some of the best physicians in a variety of fields. By analyzing patient-submitted reviews, Vitals® determines which doctors go above and beyond the call of duty to provide exceptional treatment and care. At our practice, we emphasize the importance of character as well as experience and training. Dr. Brunner believes that by taking the time to really hear her patients, listen to their concerns, answer their questions, and collaborate on a treatment plan, individuals will be more satisfied with their results. Accolades are wonderful, and they show that our team is headed in the right direction. But the most important part of our jobs is helping people achieve their cosmetic dreams. Come see the difference compassion makes. Talk to us today about your aesthetic goals.